The hotel is located only a few minutes from the old city gates of Porta Venezia which marks the start of Corso Buenos Aires, one of the longest shopping streets in Europe. The Central Railway Station – Stazione Centrale is only 2km away and , moreover, our hotel is also accessible from the highways and airports and is only a few stops away on the underground to piazza Duomo. The Antares Concorde Milan offers unrivalled hospitality and the relaxed and refined ambience is enhanced by classic furnishings complimented by fine marbles and soft sofas the “Nascita di Afrodite” by Teresa Pomodoro and Paintings by the master La Pica and enjoying place of honour the fountain in glass by the sculptor Aurelio Gentilio. The 120 rooms, are distributed on 10 floors and have recently been completely renovated and modernised. Soft pastel colours combined with new furniture in traditional style with an English look but Italian taste, ensure a relaxing atmosphere. Recently the hotel rooms have each been equipped with Wi-Fi wireless high-speed Internet Connection. All rooms are completely soundproofed, private bathroom with either shower or bathtub, direct dial telephone, mini bar, satellite and pay tv, air conditioning, wi-fi broadband internet service, safety deposit box and interactive guest welcome system. Quality, modern meeting rooms in Milano are hard to find but luckily here at the Hotel Concorde we have come up with a fresh approach to meeting your business needs with 7 ample sized meeting rooms. Flexible spaces, easily transformed to meet your business needs, with an emphasis on state-of-the-art technology, natural light and contemporary design. Complimentary use of our wireless broadband internet network is also provided in all meeting rooms and public spaces. There is also a Conference Centre with capacity for up to 300 delegates. 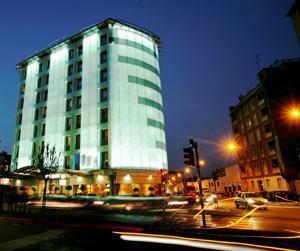 Ph.+39-02-26112020 – e-mail: concorde@antareshotels.comFirst Class Collection of Worldhotels. Quality, modern meeting rooms in Milano are hard to find but luckily here at the Hotel Concorde we have come up with a fresh approach to meeting your business needs with 6 ample sized meeting rooms. Flexible spaces, easily transformed to meet your business needs, with an emphasis on state-of-the-art technology, natural light and contemporary design. Complimentary use of our wireless broadband internet network is also provided in all meeting rooms and public spaces. There is also a Conference Centre with capacity for up to 300 delegate.Hosting your meeting at the Antares Hotel Concorde assures quality, attention and professionalism but, above all it means you are in an ideal position located only 50 metres from the Turro Metro Stop (red line) making access to the meeting venue easy for everyone. In addition Piazza Duomo is only 8 metro stops away with no need to change line.